I’m not exactly sure how it’s happened, but I seem to be evolving into some type of Chai expert. In the past few months, I’ve tried 4 or 5 different types of Chai…probably pushing 10 if I go back a few more months. That’s a lot of Chai. And in sampling all of the different varieties, I started to figure out that – just like Chinese food (where you have authentic and Americanized and they taste totally different) – there is “Americanized” Chai and authentic Chai. If you want to taste the real deal, you can completely tell that this is Chai and you know that it’s tea, Chai then I suggest you try Tipu’s Chai. The goal of Tipu’ Chai is to introduce quality, authentic, Indian chai to the North American market. The recipes we use have been handed down through three generations of the founder’s family and have traveled three continents. Our chais are characterized by their bold, robust, and spicy flavor. 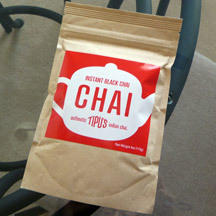 What makes Tipu’s Chai stand apart from some of the other Chais I’ve tasted is how clear the tea flavor comes through. 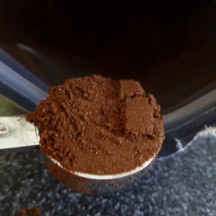 According to the packaging, you add 1 teaspoon of chai to a water/milk blend or for extra creaminess, a full milk blend. I was a little skeptical because the amount of chai seemed so small when compared to other mixes where you have to add a tablespoon or more to make a drink. Once I opened the bag and took a sniff, I understood why you only needed a little. This mix is POTENT – as in when you smell the mix, you can tell that there are actual, legitimate spices mixed in. For my first cup, the one with 100% milk, I also added 1 1/2 teaspoons of sugar for some extra sweetness. Has a great initial kick of spices on the first sip but the flavor smooths out as you drink it. I thought that the milk tamed down the flavor a little bit and it definitely seemed creamier, even though there is no creamer in the Tipu’s Chai mix. That’s actually another thing that makes Tipu’s Chai different – the fact that they do not have any milk powder, non-dairy powder, or sweetener already added to the mix. You can truly customize your mug to taste more (or less) like tea. 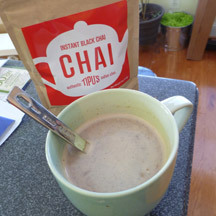 Tipu’s Chai truly is an authentic Chai tea mix. True to tea form, it even leaves a trace amount of spices on the bottom of your cup. You can make it with milk and add sugar to make a Chai Tea Latte or drink it with milk and water to make a true tea. 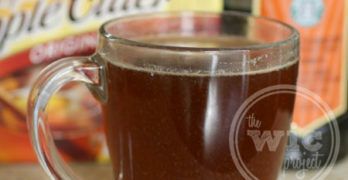 It’s flexible, has tons of Chai flavor, and has a spicy flavor that some other teas lack. original black chai mix sounds good! It is! The kind that will really impress the neighbors the next time they come over for tea/coffee. LOL. 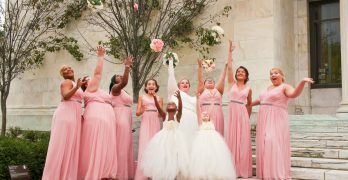 The original is fantastic! 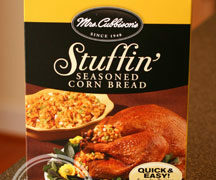 I haven’t had it for years, but it still lingers. NOTHING compares to Tipu’s! Glad to know another Tipu’s fan! Thanks for stopping by.